As I've previously lamented years past, whilst the ubiquitous Lycoming T-55 (helicopter engine) turbines are spooling down upon the finger docks of Stan Sayres pits - after having fallen totally out of favour with what once was a cherished childhood tradition of pulling plywood planks behind our bicycle's wheels - when the Hydro’s ruled the roost from the shores of Lake Washington with those irresistible thunderin' Aircraft piston powered engine Hydros'. With names such as Dean Chenoweth in the Miss Budweiser, Chip Hanauer in the Squire Shop and finally Jim Kropfeld piloting arguably my favourite boat of all time, the Uber NARLY' Rolls Royce Griffon Beer Wagon - which totally electrified Mwah, were some of the Baddest Boats on Lake Washington. Yet I ultimately flamed out in the late 1990's, probably after Chip (Hanauer) left the unstoppable "Beer Wagon," the Bud, aka Miss Budweiser. As really cannot say that Dave Villwock ever turned my Prop'. While my most cherished memory of Seafair - which ironically I still haven't confirmed the year yet, since it was some four decades ago! Was thee Donnybrook 'O Donnybrooks when the dreaded Pride of Pay 'n Pak narrowly defeated my cherished Miss Budweiser! As I can still vividly recall that Oh So Beautiful red & white front engine, open cockpit with trailing headrest Miss Budweiser hull with Mickey Remund at the controls screaming thru the aqua blue waters of Lake Washington at speed trailing frothing white Roostertail's in its wake! or was it the legendous' Dean Chenoweth driving instead? Since I still cannot recall if it was the 1973 or 1975 race I revel over when the Pak beat the Bud by some scant 100-feet (or yards) after going neck-to-neck for all five laps! Which I recall the next day's Newspaper's headlines proclaiming something to that effect. Since all I know now is that I had to wash the family's automobile after Tomas Sr. had chosen Pay 'n Pak in what is still probably my favourite Seafair race - which the Unlimiteds' have been contesting ever since 1951! As ironically, 'Wayback then I never picked-up upon the fact that it was actually an -ex Pay 'n Pak hull that Bernie Little had bought in order to beat his fiercest competition all those years ago: CRIKEYS! Since Bernie Little and Dave Heerensperger were good personal friends off the water, but Y'all know the saying of when the helmet goes on! Or in this case when their respective boats hit the water, the gloves come off! As Heerensperger sold his lap record setting Pride of Pay 'n Pak hull to his arch nemesis Little in 1972. 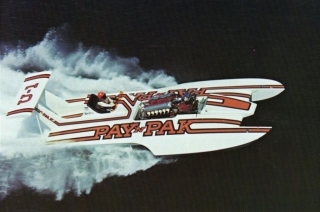 And following that year's Seafair event boat designer Ron Jones started work on the aluminum honeycomb "Winged Wonder" Pak', and thus, we'd be treated to a Battle Royale the next three year's extensively between two Pay 'n Pak hulls. Alas, over one-half century ago during a time when Unlimited Hydroplane racing ruled the roost as the city's main sporting event pre Professional Sporting Franchises such as the Seattle Supersonics, Mariners, Seahawks, Sounders or Storm existed, a unique craft (one of many) prowled the shores of Lake Washington and beyond flying the flag for the Seattle Yacht Club - ultimately putting the Pacific Northwest on the map, much to the disgust of the "Motor City!" Yet her name wasn’t the legendary Slo-mo-Shun IV or Slo-mo-Shun V which put Seattle permanently in the spotlight with its unprecedented Gold Cup success between 1950-54. Although the Miss Thriftway brought the Gold cup back to the "Jet City," which was penned by Ted Jones, creator of the revolutionary Slo-Mo-Shun's, the Miss Thriftway and her successor, the Hawaii Kai III both owe part of their lineage to Jones earlier creations. But instead of the revered Sayres rosso colours, it would be the hull affectionately known as the "Pink Lady," ultimately known as the Miss Hawaii Kai III which for many Seattleites became the Slo-Mo's successor. After Seattle's Dom 'O Unlimiteds' Stan Sayres Slo-mo's had given up the ghost - finally being upstaged by Detroit's Gale V after their 1955 Gold Cup defeat. Along with Slo-Mo-Shun IV's pilot, the '53 Gold Cup winner Joe Taggart suffering serious injuries during the '56 Gold Cup weekend n Detroit where his boat literally disintegrated after being stricken by a rogue wave from an illegally moving patrol boat! With Taggart's injuries ending his Hydroplane driving career a la his team-mate Lou Fageol. Stan Sayres, having zero desire to visit his broken hull's remains, now returned to Seattle, died in his sleep three weeks later, presumably of a broken heart! As the Hawaii Kai III carried on the Slo-Mo's legacy with her Rolls Royce Merlin engines and crew transferring to the once rival boat, beginning with the '56 President's Cup which Bill Muncey aboard Miss Thriftway won - returning the storied chalice to Seattle's Yacht Club. Yet with the demise of the Miss Thriftway when Muncey collided with a U.S. Coast Guard patrol boat! The Kai continued its dominance of the waters for the '58 season with an ultra popular Gold Cup victory at Seafair en route to that year's National High Points Championship whilst ensuring Hydroplane glory for the Emerald City with another year's Gold Cup defense on Lake Washington. Interestingly, the eventual "Mr. Unlimited," nee Bill Muncey began his career driving Seattle based hulls during the era of Detroit v Seattle for Unlimited supremacy. Winning his first two Unlimited races, the prestigious Gold Cup aboard Seattle owner Willard Rhodes Miss Thriftway in 1956-57. Muncey followed up his Gold Cup success with a further two Cup victories aboard the renamed Miss Thriftway, now the Miss Century 21, a promotional ploy for Seattle's 1962 World's Fair - winning the Cup in Reno, Nevada and Seattle 1961-62, netting half of his eventual eight Gold Cup victories in Seattle based boats. Alas, as I've mused above, I was most electrified by the sport in the early 1970's, even though the NBA Seattle Supersonics with Hall of Famer Lenny Wilkens was at the controls as a Player/Coach between 1969-72, before later coaching the Sonics to their only National Basketball Association championship in 1979. Yet for Mwah, during those Halcyon early 1970's, in what I guess should have been another indication of my eventual 24/7 infatuation of Motorsports, I was solely focused upon the Hydroplanes instead. With this infatuation lasting effectively up to the Bud's "Bubble Boat," introducing the now de riggour jet fighter canopy and then the first turbine Beer Wagon - both piloted by the late Jim Kropfeld before my interests in the B-I-G' BOATZ Flamed Out. Hmm? Perhaps it was when that dreaded Heerensperger's Pay 'N Pak turbine boat began kicking tail again. Or was it that dastardly "Blue Blaster" winning instead? Which makes me wonder where 'Ol Jimmy Lucero - the George Bignotti 'O Unlimiteds' Crew Chiefs is? As I find it only appropriate that Dave Villwock took victory at Seafair in the Beer Wagon's final year in the sport - after their iconic owner Bernie Little had passed away in 2003, albeit Terry Troxle should have won that day, although he was penalized for jumping the start by a micro-second whilst jousting for the lead at the gun whilst skimming the waves at 185mph vs. Villwock. And although having largely given up upon this annual passage of Summer in Seattle some two decades ago, I seem to think that I did watch Seafair's only Kuhnaidiun winner (Jean Theoret) win the '06 event for another Unlimiteds' legend, Billy Schumacher aboard the Miss Beacon Plumbing. As its somewhat symbiotic that I was first momentarily drawn back in by the then unknown to Mwah Steven David, piloting the "Jerky Boat" aka Oh Boy Oberto five years ago. As how could I not route for a Northwest tradition who's "Pitchman" now is that Oh, So Luvable' Seahawks Star Richard Sherman! Not to mention this new blood putting a dent in ‘Ol Davey V’s (Villwock) veritable chokehold upon the H1 Unlimiteds record books, albeit it’ll forever be the APBA to Mwah instead! Yet those Steve David Salad Dazes seem so distant now, when his maiden Seattle victory in 2007 was a Fairytale story for longtime owner Art Oberto who was celebrating his 80th birthday! As protagonists Villwock and Theoret, the race's past three year's winners were so consumed in outsmarting each other for lane choice that they both got to the starting line late - which David totally capitalized upon!